Just a little reminder and some motivation to read Quran every day. I’ve found that regular recitation of the Quran, no matter how much or how little, will allow you to cope better with day to day trials and challenges. 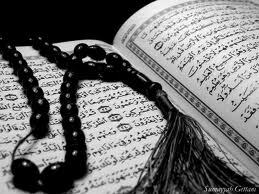 There is something enlightening about reciting Quran and whether you understand it or not, we can all benefit from it. Allah says “If anyone finds no time for my remembrance and for begging My favours due to remaining engaged in the recitation of the Quran , I shall give him more than what I give to all those who beg favours of Me.” The superiority of the Word of Allah over all other words is like the superiority of Allah over the entire creation. One who recites the Quran and he is well versed in it ( i.e its recitation), he will be in the company of those angles who are scribes, noble and righteous; and one who falters in the recitation and has to exert himself, gets a double reward. If Almighty Allah opens the locks of your heart, then you would become aware of the marvels, wisdom and knowledge found in the Holy Qur’an, with the result that you would not have to ponder on other sources. Because whatever there is, found in its pages, as the Almighty says in the Holy Qur’an:” Nothing have we omitted from the Book” (Surah Anam Verse 38). Schedule some ‘Quran time’ in your day so you can benefit from one of the greatest favours from our Lord. A few minutes in the morning or before you get to bed, make it habit and encourage those around you. Whether you understand Arabic or not, recite sincerely and you will feel the effects of divine guidance in every aspect of life. This entry was posted in Daily Reminders, Reminders, Uncategorized and tagged Allah, enlightenment, Faith, Good deeds, guidance, Inspiration, Islam, Koran, Muhammad, Muslims, Prayer, Prophet Muhammad, Quran, remembering, reminders, Spirituality, Wisdom. Bookmark the permalink.